Senior defenseman Sara Schmitt skates down the ice during a game against New Hampshire on Oct. 4 at the Ohio State Ice Rink. OSU won, 4-3. The Ohio State women’s hockey team doesn’t want to repeat history as it heads into this weekend’s series against Minnesota State University. Last season, the Buckeyes (5-3-0, 3-3-0) fell to the Mavericks in both games of their first series. OSU lost the first game, 4-1, and the second game, 2-1. Coach Nate Handrahan said that series is still in the back of his mind. MSU has struggled so far this season. With seven losses and one tie, the Mavericks have yet to taste victory this season. Regardless of the Mavericks’ record, senior defenseman Sara Schmitt said she expects “a gritty game,” against MSU. Handrahan agreed, and he said MSU’s record isn’t a good reflection of the talent the team has. The Mavericks have a lot of young players in their lineup. With a roster of 24 players, 16 of them are underclassmen. The Buckeyes currently have seven freshmen on their roster, while the Mavericks have 12. The series will see the Buckeyes hitting the road for the second time this season, this time to Mankato, Minn. Handrahan said the team’s energy for away games is different than for home games. “Away games eliminate distractions,” he said. Handrahan added away games give the players time to bond as a team. Freshman goalie Kassidy Sauve said she is excited to fly with her team because this season’s first away trip was taken by bus. “This is all of the freshmen’s first flying trip, so I think it will be cool for us to experience that and hopefully we do well this weekend,” she said. Sauve was named the WCHA Rookie of the Week on Tuesday, the second time she has received the honor this season. With three shutouts this season, the young goalie ranks third in the national standings. She has started all eight games of the season for the Buckeyes and is ranked second in the nation compared to other freshman goaltenders for number of saves, with 180 stops. “Ignorance is bliss,” Handrahan said regarding the performance of his goaltender. “When you are a younger player, sometimes you just play and there isn’t this thought about what’s going on all around you. She is learning the pace of the game at the college level and has done some good things,” he said. 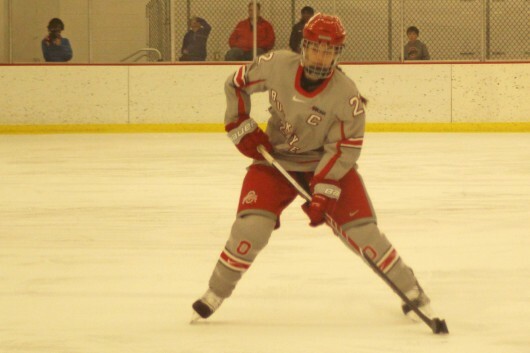 The coaches see a lot of development in Sauve’s future as a Buckeye, Handrahan added. However, Sauve sets goals for herself one series at a time. “Play solid and come out with two wins,” she said. “These are must-win games for us. We are going to try to sweep them on their home ice,” Schmitt said. The Buckeyes are scheduled to take the Mavericks in the first game of the series Friday at 7:07 p.m. The second game of the series is scheduled for Saturday at 2:07 p.m.